ATLANTA – February 3, 2016. 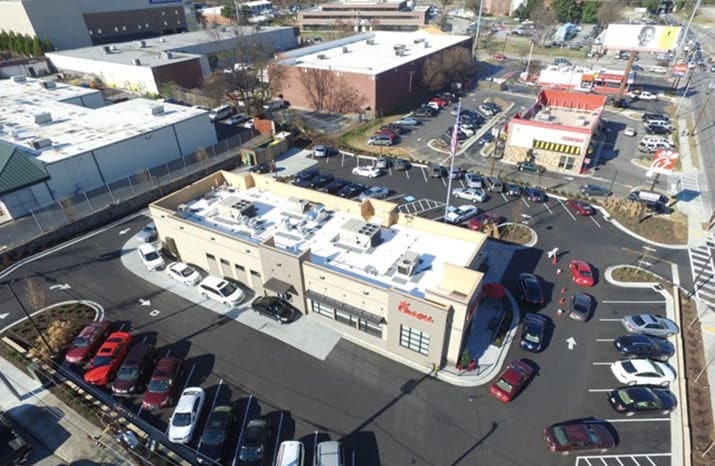 One of the largest landowners in the area, the investment team of Westside Ironworks sold the nearby Chick-fil-A site in West Midtown for the highest price per square foot for a single-tenant transaction in Atlanta history, according to CoStar. In a deal that closed on January 12, the 1.015 acre site that houses the 4,500-square foot quick-serve restaurant traded for $4.75 million – nearly $1,600 per square foot – with a cap rate of 4.0%. A Midwest-based real estate developer acquired the site at the intersection of Northside Drive and Ethel Street from the investment team led by Jeffrey Stein, founder and principal, Stein Investment Group, and Frank Buonanotte, founder and chairman emeritus, The Shopping Center Group. Chris Bossworth of CB Richard Ellis represented the seller. “The synergy established with other neighboring fast dining restaurants that we’ve brought to the area makes this block of Northside prime investment property,” explains Stein. “We have secured unique retailers and restaurants on our properties that complement the West Midtown neighborhood, quickly increasing property values.” The investment team acquired the property in October 2014, subsequently demolishing the site’s existing warehouse in July 2015 to make room for a multi-year ground lease with Chick-fil-A. The Stein/Buonanotte team has also invested more than $9 million to redevelop the recently completed Westside Ironworks situated across from White Provisions District and Westside Urban Market on Howell Mill Road. The team owns multiple properties in the immediate area including: a 0.9-acre site housing quick-serve restaurant, Cook Out adjacent to Chick-fil-A; the Progressive Lighting building, approximately 25,000 square feet on 1.5 acres at 650 14th Street; and the Switch Modern building, approximately 27,000 square feet on 1.1 acres at 670 14th Street. The leaders of the investment, Frank Buonanotte and Jeffrey Stein, share decades of commercial real estate experience. Stein serves as principal of Stein Investment Group, a third-generation, private real estate investment firm with over 150 years of combined real estate experience. The firm’s two million-square foot portfolio includes 250,000 square feet of retail, 225,000 square feet of office, 1,400 multi-family units and over 900,000 square feet of nationally recognized, self-storage facilities; and it continues to seek unique real estate acquisition opportunities throughout the Southeast. Buonanotte is the founder and chairman emeritus of The Shopping Center Group, the largest, privately held retail real estate advisory firm in the United States.